Thanks to their overwhelming presence on the World Wide Web, it has been postulated that cats will, one day, rule the entire world. And what would that cat-astrophic world look like? Well, we got a preview of that last Saturday at Kitty City, a miniature metropolis designed exclusively for members of the feline species by a team of highly talented humans. 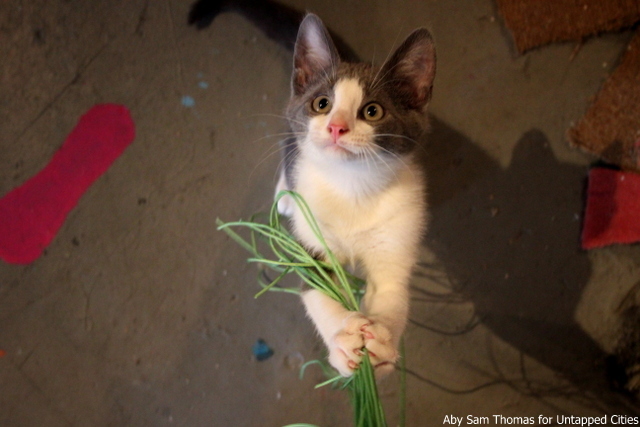 The project, which was organized by, and hosted at, Flux Factory in Long Island City, was developed over a course of four weeks, with artists, architects and children collaborating to build the perfect urban environment for cats. On Saturday, Flux Factory unveiled Kitty City to the world, and let 23 cats take over the colorful, intricate space that was filled with tunnels, loops and strings galore. The cats, most of whom were kittens, were brought to the space by For Animals, a no-kill animal shelter in Queens, and human visitors to Kitty City were given the option to adopt the animals free of charge. Also seen at the event was Neighborhood Cats, an organization that aims to reduce feral cat population with their trap-neuter-return drive, one of the most humane ways to control the overpopulation of cats in communities. Of course, cats being cats, they didn’t seem to be too interested with the level of artistry in this project. Having said that, they seemed to be having a rollicking good time nonetheless. While some lost themselves in the dangling threads of Kitty City, others decided to while away the time by taking dozens of catnaps. There were plenty of purrs going around the room, as human visitors to Kitty City found themselves entranced and bewitched by those ridiculously cute furry faces. According to For Animals’ Facebook page, 13 cats were adopted at Kitty City on Saturday. For more information on Kitty City, and upcoming projects by Flux Factory, check out their official website here. You can also follow them on Facebook and Twitter. If you’d like to adopt a cat yourself, or for more information on For Animals, check out their official website here. You can also follow them on Facebook and Twitter. For more information on Neighborhood Cats, and to learn about their trap-neuter-return drive, check out their official website here. You can also follow them on Facebook and Twitter. Flux Factory Artists in Residence Showcase Works by JOSEY BARTLETT Read the original here.